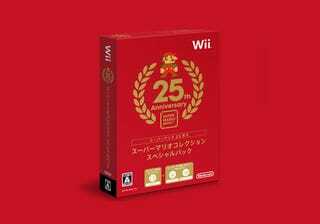 Please, Nintendo, release the Mario 25th anniversary collection in the West. Not for the games, we've got those, thanks. Just for the box. This fetching art adorns the special bundle for Nintendo's Mario 25th Anniversary bundle for the Wii, which includes Super Mario All Stars (a compilation of early Mario games first released on the Super Nintendo), a soundtrack CD and a DVD detailing the history of Nintendo's mascot. It'll be out October 21 in Japan, and cost ¥2,500 (USD$30).